Extract from Fig. 1 of Heuzé et al. (2013): blue means that the model’s bottom water is colder than the observations; red that it is warmer. Assessment of the bottom water properties of 15 CMIP5 models over 1986-2005 against observations. 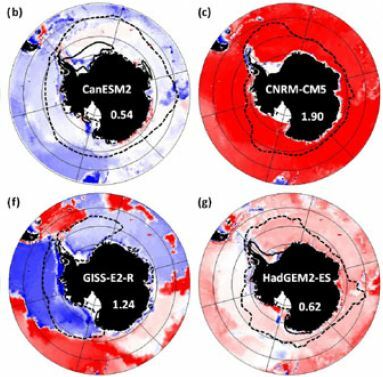 We found that CMIP5 models form dense water on the Antarctic shelf, but cannot export it to the open ocean. Instead, models form their Antarctic Bottom Water by open ocean deep convection. The models with the most accurate bottom properties are the ones with extensive deep convection in the Southern subpolar gyres.